Little by little, as I delved further into this comic wonder, it became clear that Humble Homes is no design book. Yes, it presents a whole array of miniature dwellings, from “The Basic Box Cabin” to the “Fort-a-Saurus,” but what this book really illustrates is a lifestyle. And I’m not just talking about Deek’s love of salvaging (bent branch door handle, yes please! ), or his eco-awareness (rain water shower, anyone?). This book channels his magnetic creativity, transmitting a sense of nostalgia for the jungle-gym joy of childhood and the limitless possibilities of a Saturday afternoon. In this way, Deek accomplishes exactly what he sets out to. As he states, "Ultimately, if this book reaches and inspires even one kid-at-heart to build ANYTHING outlined from here on out, I'll consider this book a success." I dare anyone who reads this comic/book not to run out and find/buy a hammer. 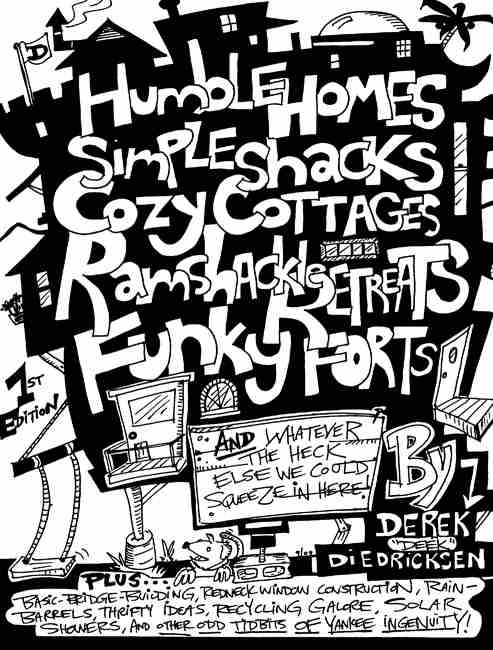 I could give you a play-by-play of all the whimsical structures featured in Humble Homes, but what stood out to me more when reading it was the man behind them. After all, this is a comic book, and as we all know, no comic book is complete without a superhero! See here for a video of the book's contents, or visit Deek's blog RelaxShacks.